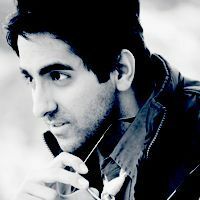 Check out the most updated and latest information about Ayushmann Khurrana's on the Internet.We have 163 videos of Ayushmann Khurrana including interviews, events, or public appearances.Ayushmann Khurrana has over 218 Fans registered on India-Forums.com. We have 296 Bollywood News articles related to Ayushmann Khurrana.Do share your criticism, comments and feedback for the Actor on Ayushmann Khurrana's comments page. We have over 44 Photos of Ayushmann Khurrana to view and download including Ayushmann Khurrana's Wallpapers. Is your email id ayushmann.kurrana[at]gmail? Or have you moved to a different account? Ayushmann you are just awesome!! My most favorite host and actor ever!! I can't wait for ur next film which is releasing in September. Dying to watch it & the new song sung by u in it !!! A wow singer! and acting such a sensitive conversational subject. Creative Person! Wish U best in life! ur sense of humour...OMG dats lyk too awesome!!! All da best for ur future films Pajji!! U r So cute ayushmann khurrana ...love ! U r sooo cuuute...! I am obsessed with ur song Pani Da Rang.